The Queen of the Nile needs your help to save the great Egyptian Empire in Cleopatra's Pyramid. Click here to play! As her most trusted friend, she needs you to retrieve her stolen Treasure; complete the task and you will be greatly rewarded! 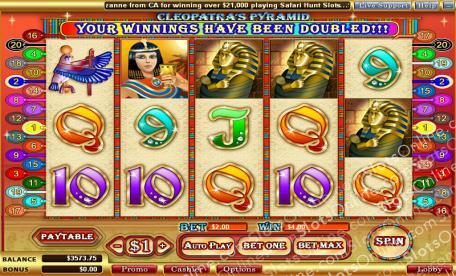 Play over 5 reels and up to 20 pay-lines in this enchanting Cleopatra slot machine. Use the Egyptian symbols to unlock the Bonus Round by getting a Pyramid on reels 2 & 4 on any active pay-line. Once inside, turn over a Stone on each level to earn big cash prizes, but beware of Snakes, as they will chase you out of the Bonus Round! The Scarab Beetle is the Scatter symbol, and finding three of them at the same time will guarantee you 15 free spins. Not only can you win extra free spins during a free spin, but also all cash payouts are tripled! Help the beautiful Cleopatra in her quest to find her treasure today, and be greatly rewarded for it! Scarab is Cleopatra's Pyramid's Scatter symbol. It can appear anywhere on the table, and not necessarily on an active pay-line. 3 or more Scatter symbols will earn you 15 free spins. The Pyramid is a wiley structure that needs to be found on reels 2 & 4 at the same time for you to be accepted into the Bonus game. Pyramids on reels 2 & 4 will see you into the Bonus Round. Once there you must pick a stone on each level to reveal the prize behind it. Players finish the Bonus Round when they have revealed a stone on each level, or have turned over a snake.